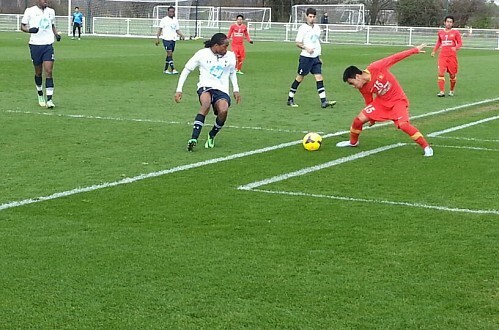 HA NOI (VNS) — Viet Nam U19 were defeated 0-9 by Tottenham U19 in a friendly match on Tuesday in England. It was their first loss in a 51-day European tour. Earlier they had won one match and drawn two. To match a powerful team, Viet Nam teams French coach Guillaume Graechen put his best players in the field. However, their weak defence helped Tottenham score two goals in just 10 minutes after the start of play. Coach Graechen asked his players to increase speed and to attack more. However, the early goals against them confused the Vietnamese players. They could not match Tottenham and the home team scored two more goals in the first half. It was the second time the two teams were meeting. The host team showed off its improved skills compared to two months ago in HCM City where it had also won 3-2. The English team players were good in both attack and defence, giving no chance to the Vietnamese players to approach their goal. Just a few minutes after the break, it became 5-0 for Tottenham with Coulthirst pushing the ball past goalie Minh Long and into the net. The national U19 team striker had also scored four goals earlier. Tottenham scored three more goals before two of their players were rested. There were only nine players playing for nearly 10 minutes, but Tottenham remained too strong for the Vietnamese side. They made it 9-0 in the 88th minute, trouncing their rivals in their worst defeat in the history of youth football.